Jacqui Talbot bestowed this “One Lovely Blog Award” on my blog. Thanks, Jacqui. What a nice thing to do. Jacqui is a multi-talented blogger friend who speaks six languages, one of which is Choctaw. She retells delightfully spirited and spiritual Choctaw tales as told to her by her grandfather. Visit her blog. I think you will enjoy it as much as I do. 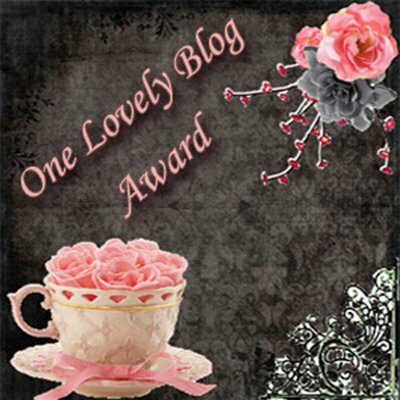 This “One Lovely Blog Award” is a very mysterious award. If you research its background, you will have difficulty finding its roots. But the rules seem to be well established and must be passed from recipient to recipient. Since a few of us… a hundred of us an infinite number of us have received this award, you may be familiar with it. The purpose, of course, is to encourage bloggers to visit other blogs, then recommend their favorites to others, something like the domino effect, or a virus, or a gathering storm. You get the idea. Pretty soon, we bloggers will take over the world or at least the Internet. Hmmm. Let’s see. Most of you know that I am a farm girl by birth, but I left the farm for the big city (Boston) when I went to college. Here are a few things you may not know about me. 1. I am the eighth child (out of nine) and the youngest girl to be born to my father, Adam Kroelinger, Sr., and my mother, Ellen Mae Kroelinger. Both parents came from Virginia, but my father’s grandfather came from Alsace-Lorraine (a region of France caught in the turmoil of changing politics between France and Germany). My grandmother, Genevieve, came from France. My mother’s family came from England. Kroey sisters. Back row L to R: Joyce, Joanne, Shirley. 2. 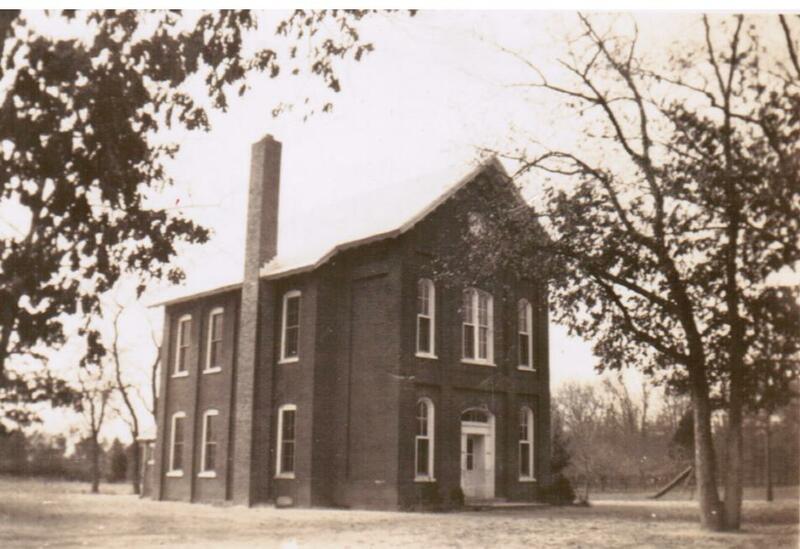 I went to a two-room schoolhouse for my primary grades and was probably the quietest child in my class. I still remember the day that…well, never mind. 3. Although I was the first one in my family to attend college, several other siblings finished college as adults. For some unknown reason, I majored in history in college, so I went back to school and got a teaching certificate and a master’s degree in special education at Boston University. My background in history comes into play now as I research the history of areas I visit on my travels. 4. After my mom passed away in 2000, I bought out my siblings’ shares of the old family house (circa 1900) in Vineland, NJ, and began to renovate it. I scraped layers and layers (years and years) of wallpaper from the walls, tore down walls and built up walls, added rooms and changed rooms, painted walls and stained cabinets, enclosed a side porch and replaced a front porch that was once removed because it was old-fashioned, and more. Of course, I had help from an excellent builder, and my siblings helped with the wallpaper scraping. 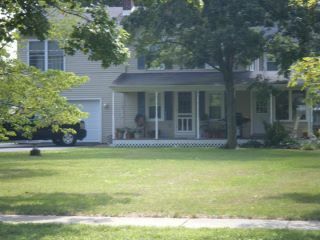 After four years in the house, I moved again for another job and sold that childhood home. 5. Although I have traveled to many places in the world, my favorite place is still the South Jersey shore. I just love beach sand, waves, shells, ocean mists, sea gulls, boardwalk pizza, and exquisite sunsets. 6. Travel, photo, food, and writers’ blogs are among my favorites. One day I will do a post on some of these. 7. In 2004, I married a man that I dated in 1963. That’s a whole ‘nother story. Maybe I’ll tell it one day. I sent a special wedding invitation just to him, announcing the upcoming marriage of the beautiful, charming, witty princess (me) to a toad named O’Heck-O-Lebster. 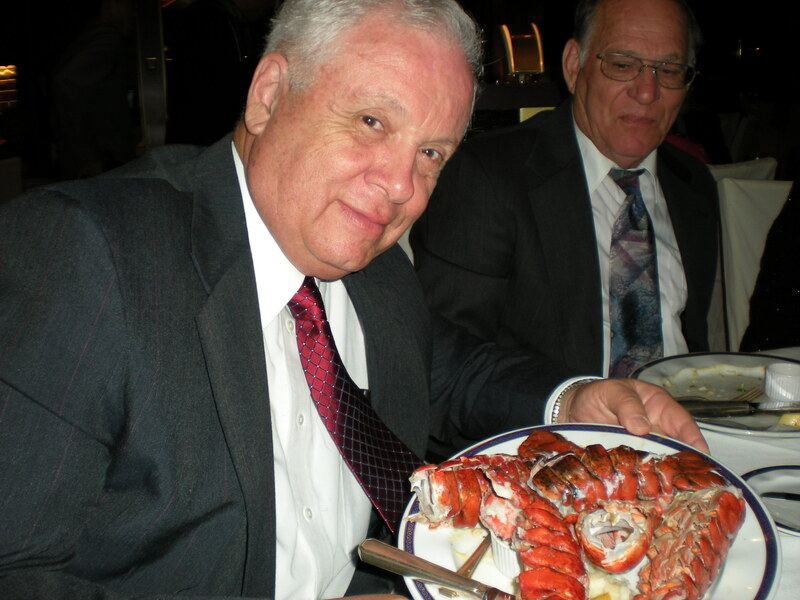 (He claimed his name was O’Heck-O-Lobster, but he was just trying to resurrect some dignity.) Anyway, he does have a good sense of humor. Thank goodness for that. 1. Emaginette‘s advice is “Live Life, and Shout About It!” That sounds good to me. And congrats to her: she won the NaNoWriMo in 2011. 3. Madison Johns, witty and outrageous writer of Armed and Outrageous, newly released book about two granny-sized detectives who give the local sheriff a run for his money on an unsolved case. Read it and laugh. Or cry a few times, too. 4. 2 Girls Lost in a Book written by a mother-daughter duo about kids’ books. Summer reading list now up. Good blog. 5. Gail M. Baugniet, Sister-in-Crime, writes about Pepper Bibeau, insurance investigator who sometimes ends up with a murder on her hands. 9. Karen Rose Smith loves cats, roses, and books. Can’t beat that combo. Cat lovers bond! Good writing, too. 10. Jodi Lea Stewart, an Arizona girl, recently published Silki: The Girl of Many Scarves, a lovely YA book about a young girl growing up on a Navaho reservation. A sequel is in the works. 11. Holly Michael‘s blog Writing Straight is about “connecting and inspiring along life’s crooked lines.” She also writes inspiration messages at http://baaaaa.com. 12. Laird Sapir is at the center of a whirlwind of activity. 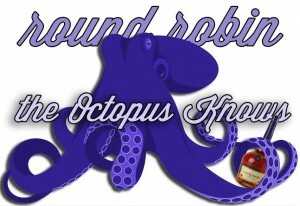 Check her blog for technical advice on blogging as well as an octopus story that is gathering chapters as it slithers and slides through the blogosphere. 13. Sonia G. Madeiros writes fantasy, science fiction, and horror. Her two cats fight each other to see which one will dominate the world. Tune in. 14. Katy Manck, BooksYALove, is a librarian-at-large and a book reviewer who looks for good books beyond the best-seller list. Go there for recommendations for good reads for your kids. 15. Teachers Donalyn Miller, Colby Sharp, and Cindy Minich write reviews for the NerdyBookClub. More good books reviews! And now, dear friends, I deserve a break. 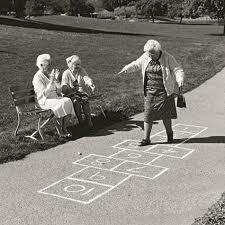 I’m gonna head out and play a little hopscotch with my senior friends. Don’t be jealous. 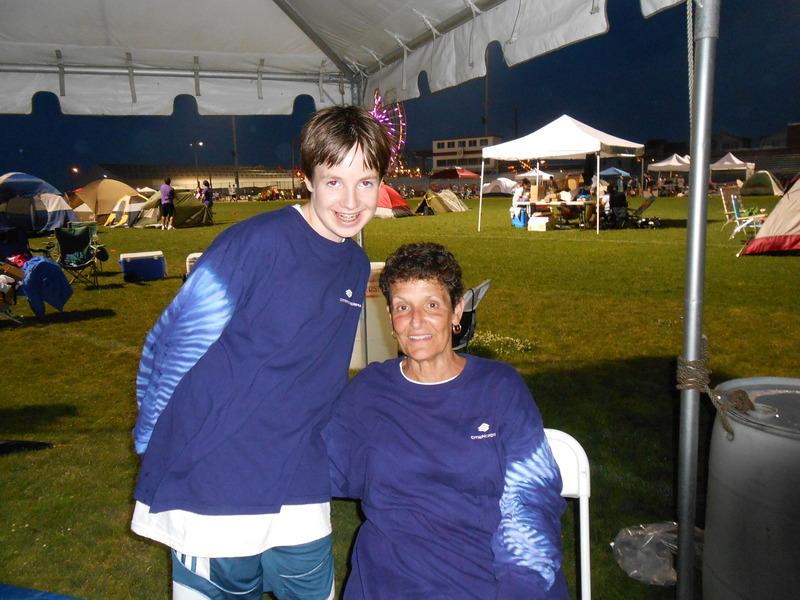 Our Ocean City, NJ, American Cancer Society Relay for Life, June 22, 2012, was almost a complete wash-out weather-wise. The local organizing committee worked hard to pull this event off, but lightning, thunder, and rain thwarted attempts to run the usual all-night Relay. Volunteers started signing in Relay teams at 4 pm, but dark, threatening clouds hung in the sky above us. 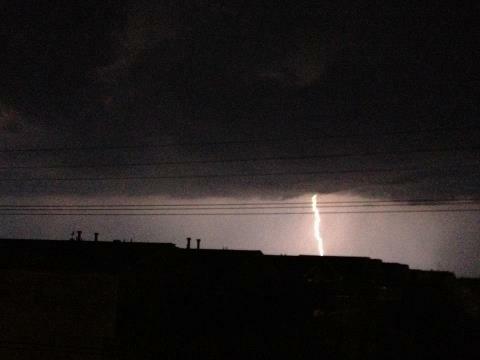 It was not a question of if it would rain, but when it would rain and for how long. Local South Jersey Channel 40 weatherman hero, Dan Skeldon, warned that we would have intermittent thunderstorms and rain throughout the evening. Still, we signed in teams and watched the skies. We advised teams not to set up their tents, but a few intrepid groups managed to get theirs up despite the theatening weather. Thunder and lightning flashes became more frequent, and the rains began, so we moved inside the Ocean City Civic Center to wait out the storm. The crowd inside dwindled a bit as some of the faint-hearted Relayers called it quits and left for home. The rest of us participated in the hastily reorganized, but memorable, opening ceremonies. 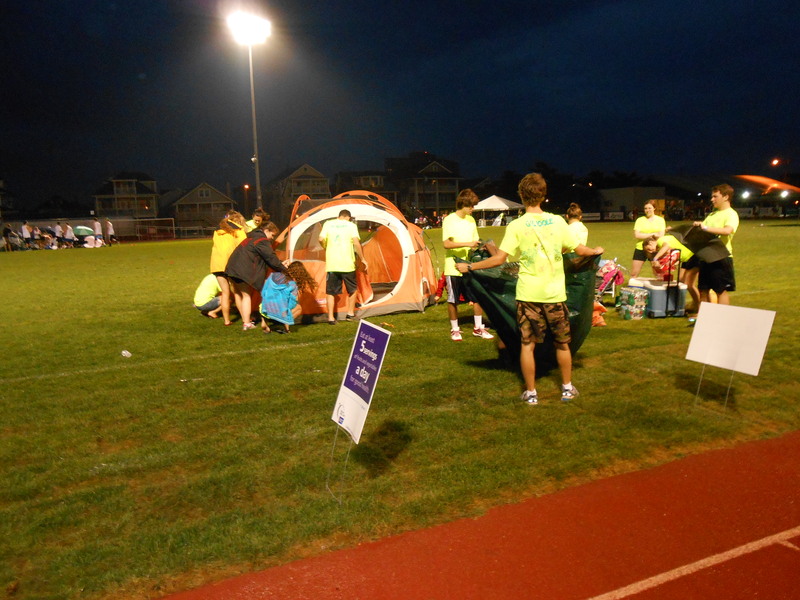 Within the hour, the rain abated, and Relayers began to walk the track. A number of teams (mostly the teens) put up their tents on the football field. My team, the NJ Krewe du Kroey, departed for local headquarters a few blocks away at the first signs of thunder and lightning but made their way back to join me on the track as soon as the rain stopped. Several pansies members of the team decided to stay home and collect those long dormant dust bunnies under the beds that were now demanding immediate attention. Oh well, their loss. 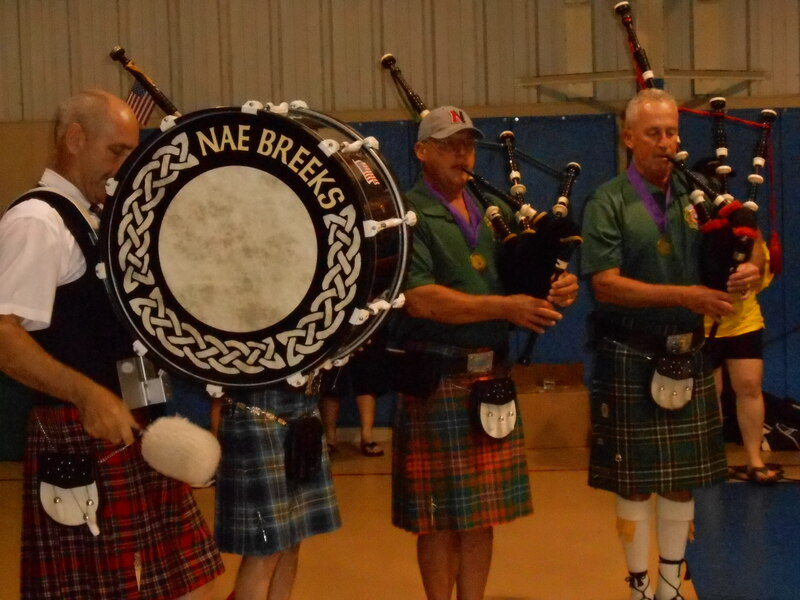 While the NJ Krewe du Kroey team dawdled in a warm, dry house, I talked with photographer Brian M Richards. At first, I thought he was with the The Press of Atlantic City, but when I talked to him, he revealed that as a volunteer event photographer, he goes to seven or eight Relays a year, takes pictures, and posts them online for the American Cancer Society (ACS) and Relay followers. 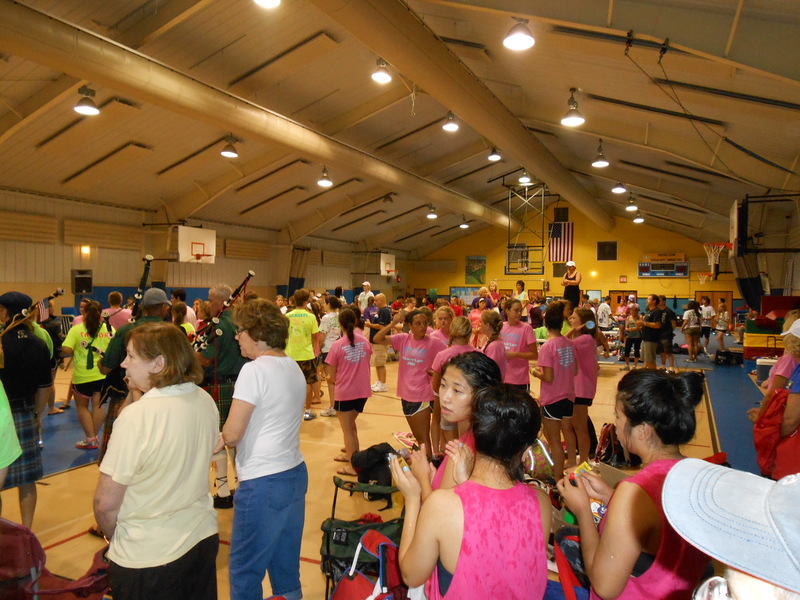 You can find more pictures of the Ocean City Relay here. 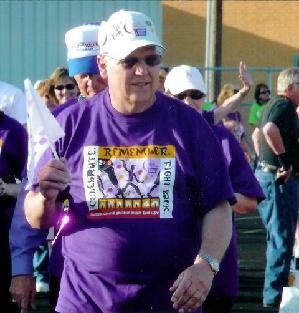 Later, I saw a familiar Relayer, Jimmy Walker, walking the track in his HOPE Relay for Life T-shirt. 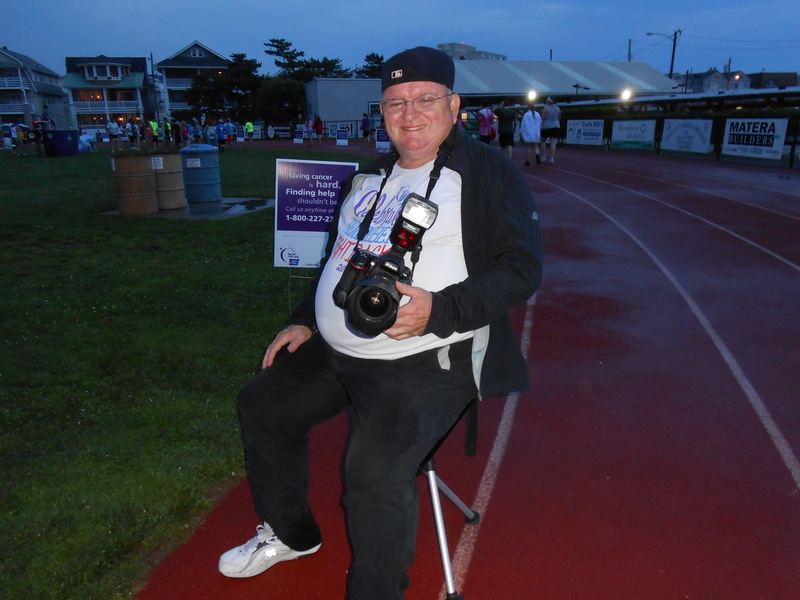 Each year we see Jimmy at the Ocean City Relay, and he faithfully walks all night long despite having to walk with a cane. Just his presence makes us smile and encourages us to complete more laps than we had originally planned to walk. 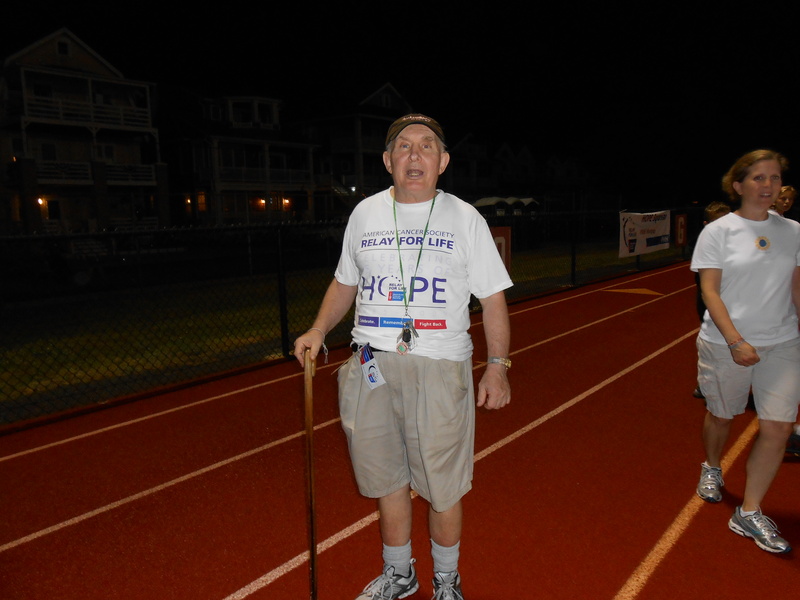 We admire his stamina, his determination, and his loyalty to Relay for Life. Because the Relay crowd had thinned out significantly, we decided to save that delicious blueberry funnel cake for another fund raising event. Then we thought we should just eat it on the spot. Hmmm. Where did it go? Other teams had fund-raisers planned, too. Delicious looking sandwiches, cupcakes, and boardwalk pizza appeared for sale at tables around the track. Food always makes for a good fund-raiser. One twelve-year-old boy designed a “Candyland” theme for his fund-raiser. This site was popular with the younger members of the NJ Krewe du Kroey who stopped by to ponder the choices. Ten pieces of candy for $1.00. What a deal and for a good cause besides! What parent (or grandparent) could argue with that? MiMi and her stash of penny candy. But the rain was not finished for the evening, and dark clouds once again rolled over the Ocean City High School football field and track. And once again, Relay activities moved inside the Civic Center for the remainder of the event. While the rain definitely dampened the Relay, it could not snuff out the spirits of the Relayers. Talk has already started about next year’s Relay! Maybe you can join us. We have asked Dan Skeldon to reserve better weather for us. Lucca, Italy. An amazing town. Post coming soon. Twelve kilometers away from Poggibonsi, the medieval fortress town of San Gimignano stands regally on a hill, preserved through the centuries. Its historic towers, dating from the 1200s, can be seen from a distance. Walk through its gates and walk into another world, another time. Originally a small Etruscan village (200-300 BC) named Castel di Salva, San Gimignano was renamed after Bishop Geminianus sometime after the 6th century. One story reports that the bishop, outfitted in shining golden armor, came riding into town out of the thick and swirling valley mists, terrifying the Goth invaders who took off without a fight. For saving their town from these evil ruffians, the people adopted his name and his patronage. They were to call on him in prayer and penance years later during many more bad times. Medieval times were hard times. Not only did the people have to worry about those Goth and Lombard invaders from the North, their own internal struggles kept them in disarray. Warring factions, the Guelphs (who supported the Pope in Rome), and the Ghibellines (who supported the Holy Roman Emperor), competed for power. This serious religious/political rivalry started in 1215 and took centuries to resolve. 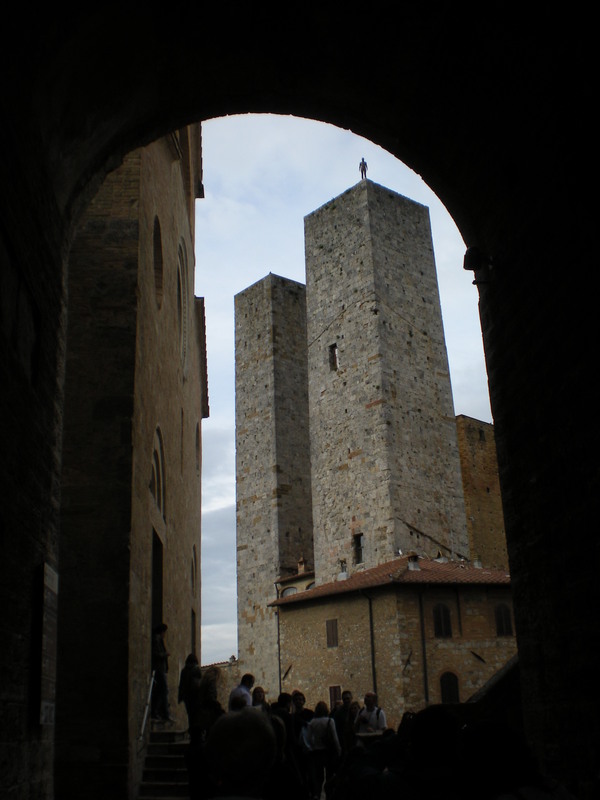 Powerful families in San Gimignano, the Adringhelli (Guelph loyalists), and the Salyucci Family (Ghibelline devotees) built towers, not only for defense against outside invaders, but also from each other. The towers also served as repositories of their great wealth and as symbols of their political power. 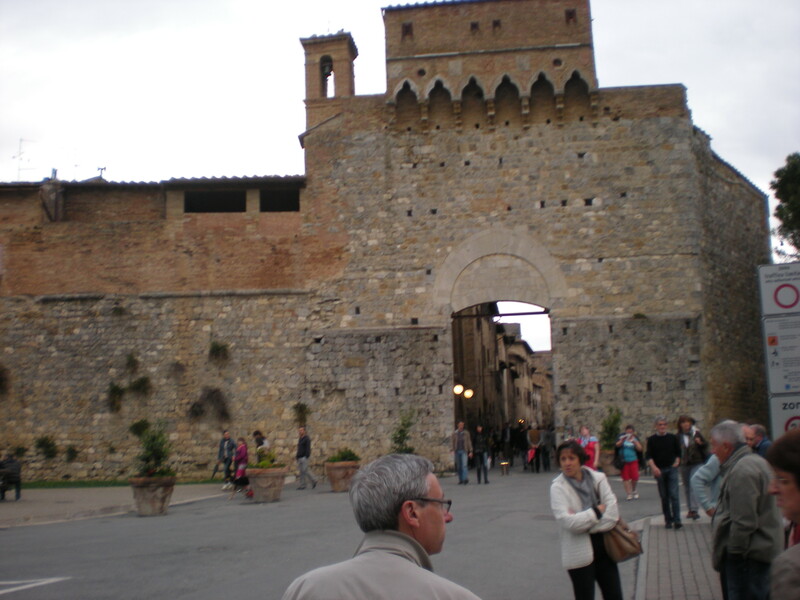 A great wall surrounds the entire town, and tall gates at the Porta San Giovanni guard the entrance. San Gimignano was conveniently located on the ancient Via Francigena, the route faithful pilgrims followed when traveling from France to Rome to pay homage to the Pope. San Gimignano became an important respite for the travelers from thieves and other troublemakers who roamed the countryside. Exhausted pilgrims and traveling merchant-traders spent the night inside the safety of the town’s walls before continuing their journeys the next morning. The city was prosperous until a series of plagues in 1348, 1464, and 1631 repeatedly decimated its population. San Gimignano fell into further economic decline when the route to Rome bypassed the city, a result of neighboring Florence’s punishing powerplay. Travel mate, Christine (right), checks a cistern which collects rainwater drained from the rooftops. 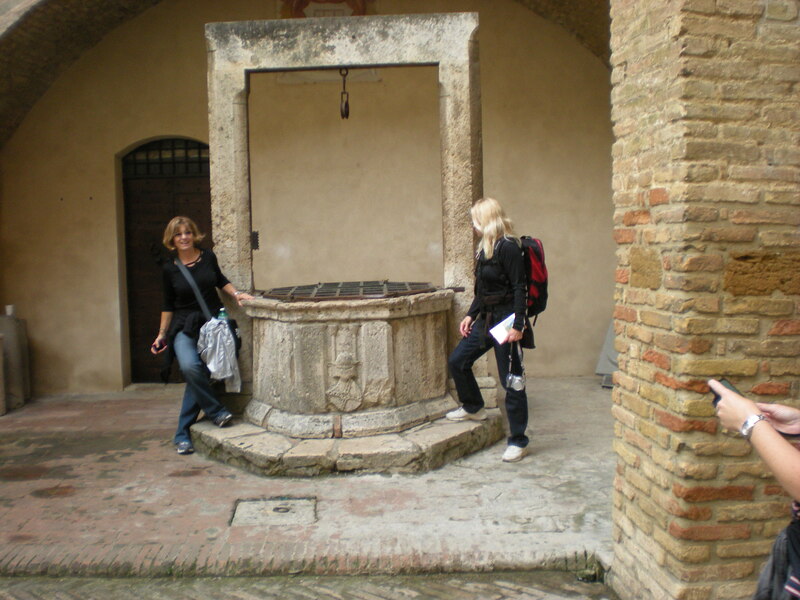 We can imagine the daily gathering of people at the cistern, gossiping and trading news about the latest events. They probably talked about the ongoing rivalry between the Pope and the Emperor and wondered when it would all end. 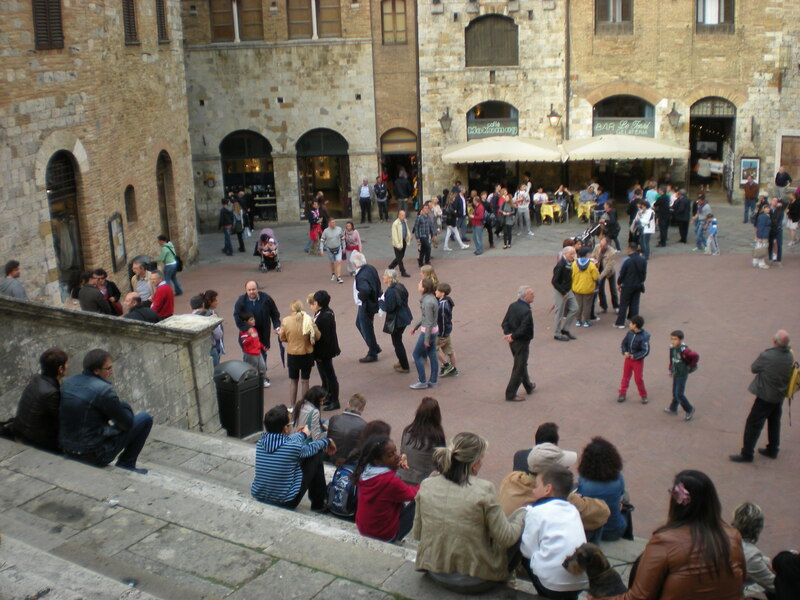 The steps of the church in the Piazza Del Duomo invite people to sit and rest for a while and people-watch. The Cappela di Santa Fina is located inside the Duomo, dedicated to a fifteen-year-old girl. For the religious faithful, San Gimignano had its patron saints. Barbara Grizzuti Harrison, author of Italian Days (1989), tells of Fina del Ciardi (1238-1253), a girl born of noble parents who became a patron saint and was venerated in this walled fortress city. One story goes that Fina, at the tender age of ten, accepted an orange from a young man, and guilt-ridden, she fell ill and didn’t move for five years, praying continuously. Another report says that she was stricken with a serious illness, possibly tuberculosis/osteomyelitis, that paralyzed her. At her death at age 15, yellow pansies suddenly bloomed profusely and angels rang the church bells. Reports of miraculous healing attributed to Fina occurred, ensuring that she would be remembered and venerated for a long time. To this day, an annual celebration occurs on March 12, the anniversary of her death, and the day yellow pansies bloom. 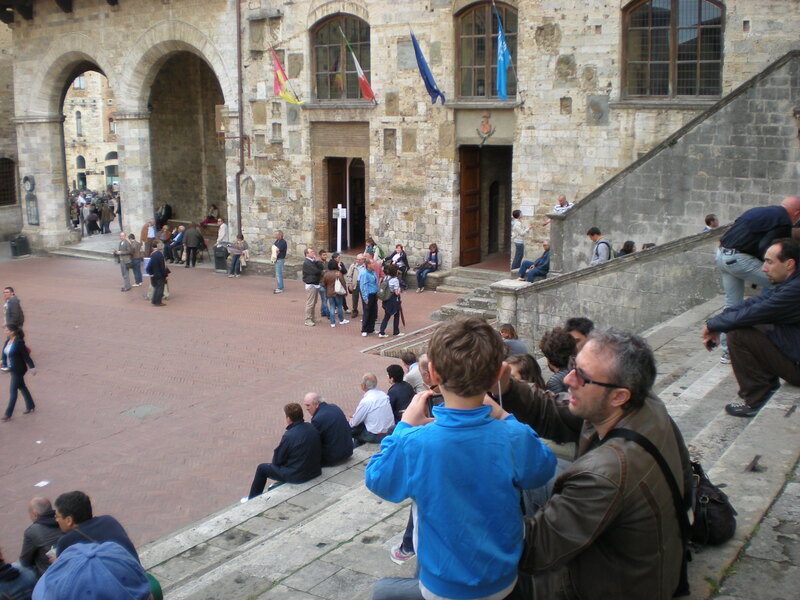 From these same church steps, The Palazzo del Popolo, the town hall (1238-1323), can be seen on the right. Dante Alighieri (1261-1321) poet, author of the Divine Comedy, and a Guelph, visited here and encouraged the people to support the the Pope in his struggle against the Roman Emperor. Alighieri was trapped on the wrong side of a Guelph internal power struggle and was exiled from Florence in 1302. He wrote Comedia (later named the Divine Comedy) describing afterlife in hell, purgatory, and paradise. Are you surprised to hear that Dante depicted his enemies suffering excruciating pain in hell? At the highest point in San Gimignano, we find the Rocca, the remains of the city’s medieval fortress and its one surviving tower. Cosimo De’ Medici, the well-known politician (bully) of Florence, had other towers dismantled in the 16th century. Now the Rocco is a lovely public park with fig and olive trees, cobbled walks, quiet places to sit, and spectaular views. 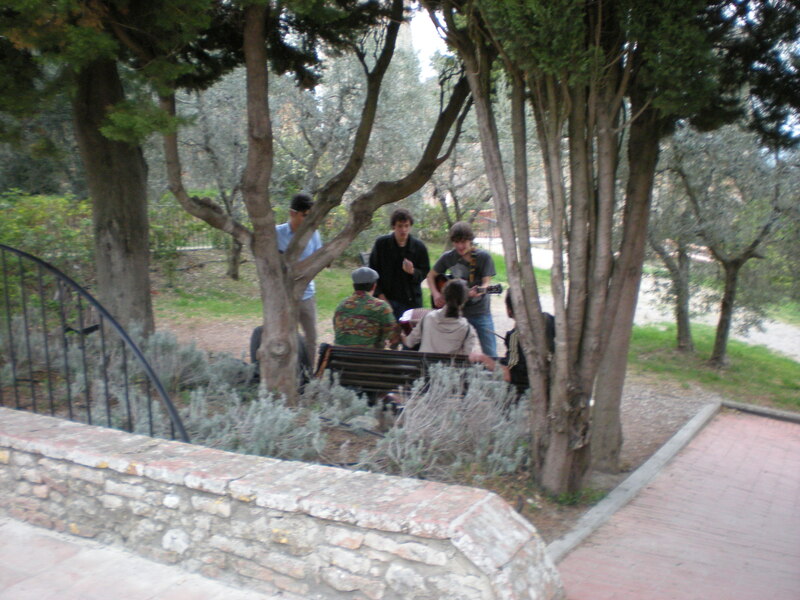 A group of young musicians have an informal session in the park, much to the delight of our foursome. Today, San Gimignano is a bustling town with locals selling wine (Vernaccia di San Gimignano, a white wine), olive oil, colorful ceramics, souvenirs, and ubiquitous postcards. Tourists fill the streets, crowding the alleys and craning their necks to view the remaining towers. 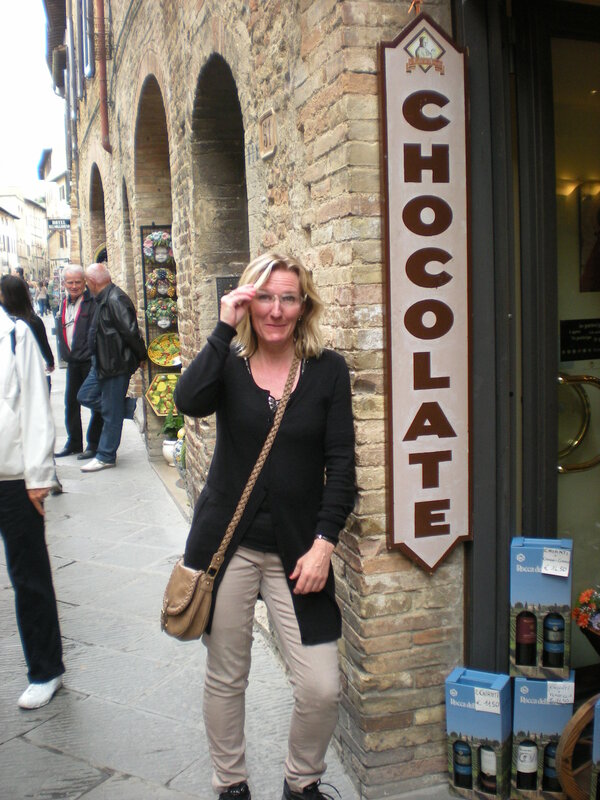 Inger-Anne (below) ponders whether her stash of Norwegian chocolate will really last for the whole week. Maybe we should get a little Italian chocolate to tide us over? 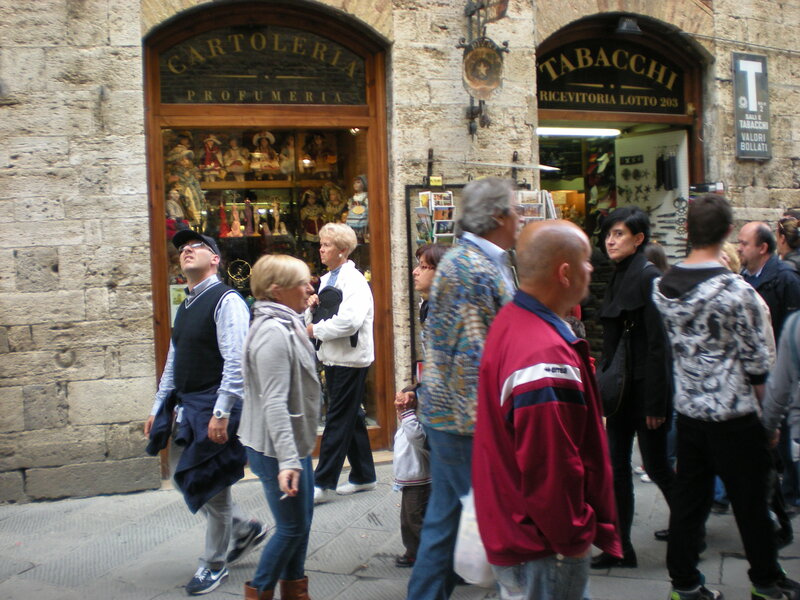 Tourists pack the street during the day but depart for their buses in the early evening, leaving our foursome to wander the alleys in relative quiet. 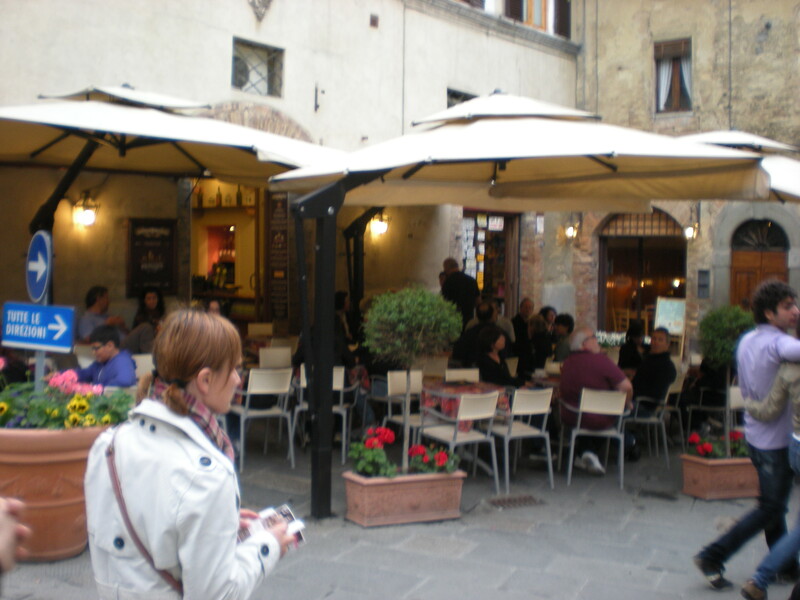 Restaurants can be found in every piazza or alley and even along the outside city walls. 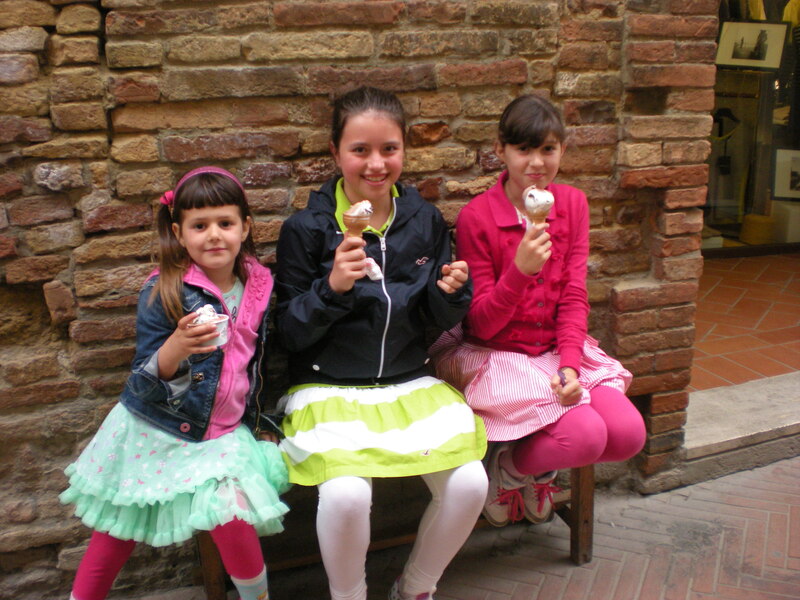 And don’t forget the gelato. 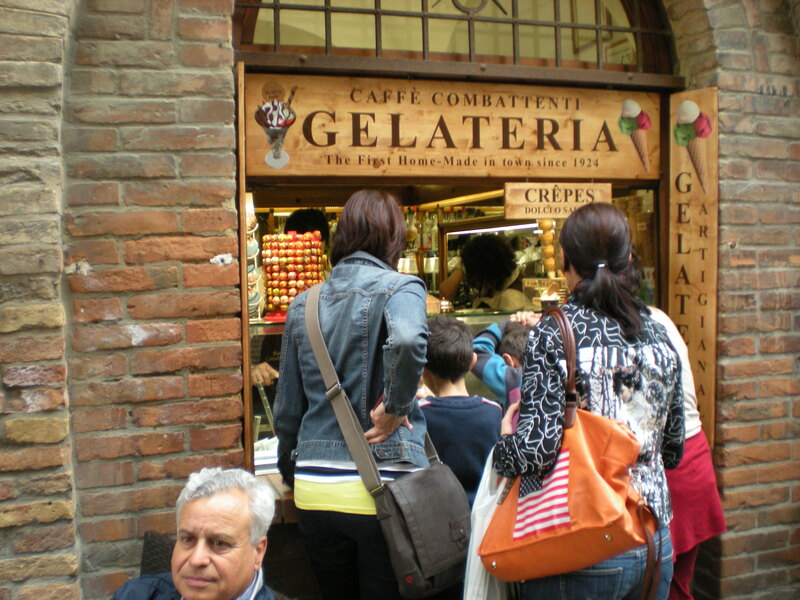 You can find a gelateria in every piazza. 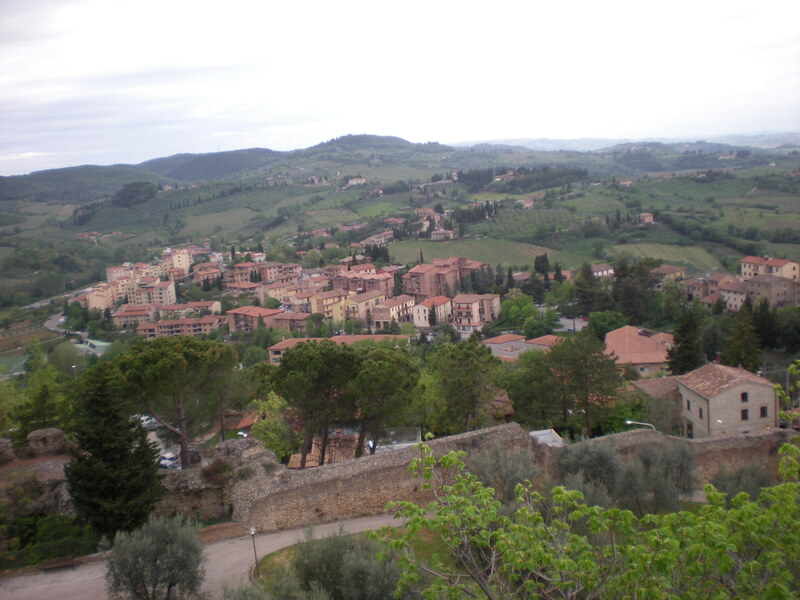 San Gimignano has served as the setting for both novels and movies. E. M. Forster wrote Where Angels Fear to Tread set in the village Monteriano, loosely based on San Gimignano. 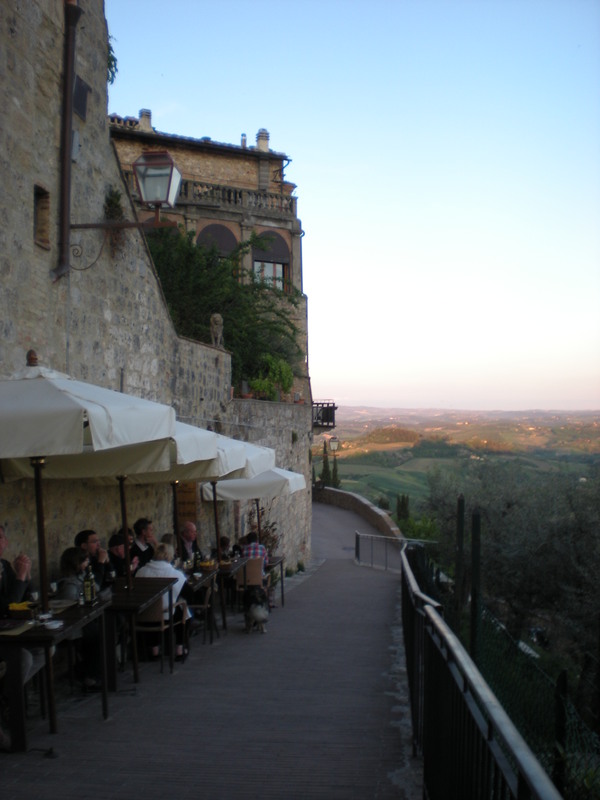 John Grisham used San Gimignano as the setting for The Broker. In 1999, the film, Tea with Mussolini, in which a group of women saved valuable San Gimignanian frescoes from destruction by the German has scenes from this area. 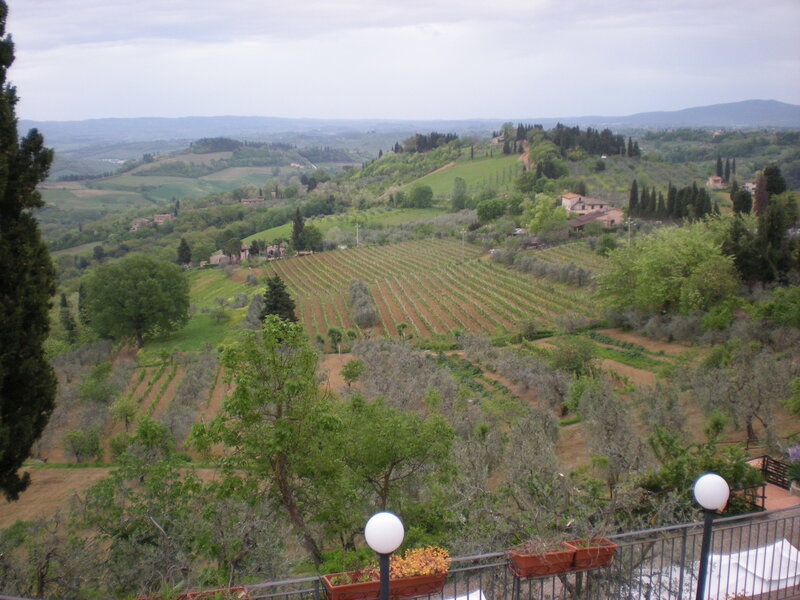 Ann Cornelisen also describes Tuscany hill scenes in her hilarious novel, Any Four Women Could Rob the Bank of Italy. And now, it’s been a long day. So let’s have some gelato ourselves. 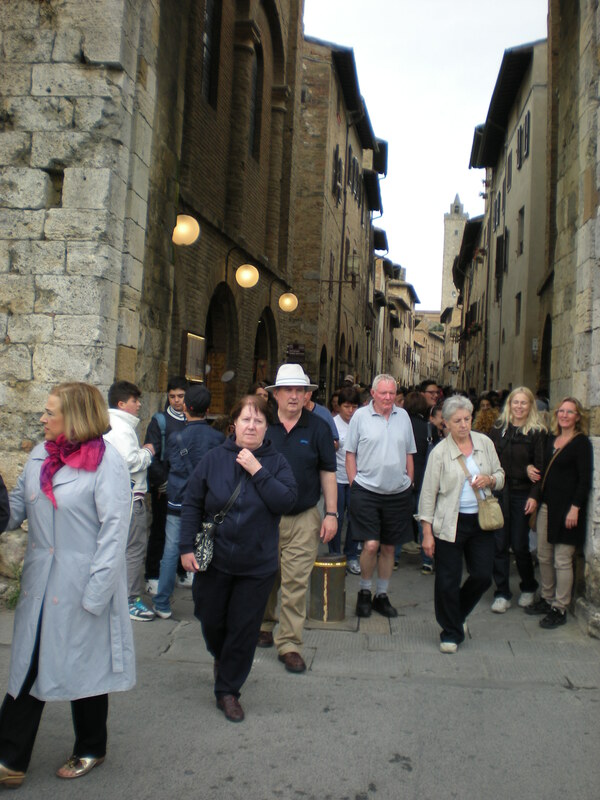 Stop by and visit San Gimignano with Rick Steves. Can four American and English expat women living in Italy outwit the local carabinieri? 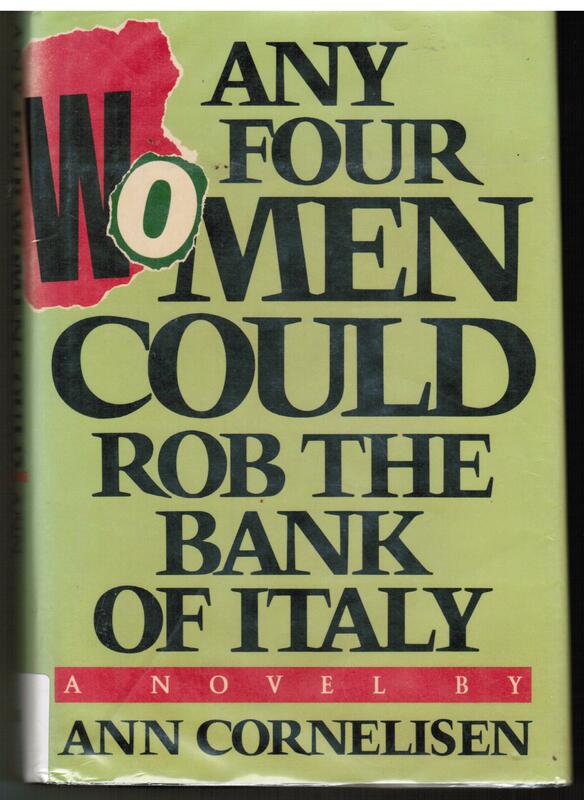 Ann Cornelison, author of Any Four Women Could Rob the Bank of Italy (1983), details how it could be done while writing a screenplay. But soon the plan becomes a challenge. Will these four women do it? Of course they will. Will they get caught? Not telling! This book has been called a “caper-romp” with serious feminist underpinning. It seems that females are so highly regarded in Italy that they could not possibly be a part of that male dominated group infamously known as “Italian macho mail train robbers.” But really, is that fair? Why can’t women have the same rights as men? As these expat women consider this issue, a daring (and hilarious) plan develops. When the police search for the male thugs who carried out this highly organized mail train robbery, heisting a huge government payroll in the process, four seemingly innocent expat women stand by and watch. The befuddled Italian carabinieri blunder through irrelevant clues, coming up with frustration and outrageous speculation. Terrorists? Really? But how can these four women prove their point if the crime is not revealed? Hmmmm. Read the book! 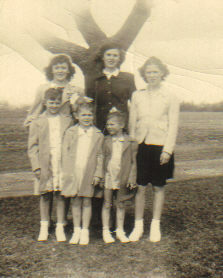 Ann Cornelison moved to Tuscany in 1954. Originally intending to be an archaeologist, she instead became involved in setting up nurseries in impoverished villages in Southern Italy with the Save the Children Fund. Later she moved to Tuscany where she bought a thirteenth-century house, the setting of the women’s crime-planning sessions. This book is an oldie (1983) but a goodie. You can find it on Internet or in your local library. We had some good laughs in Poggibonsi, a Tuscany town south of Florence. 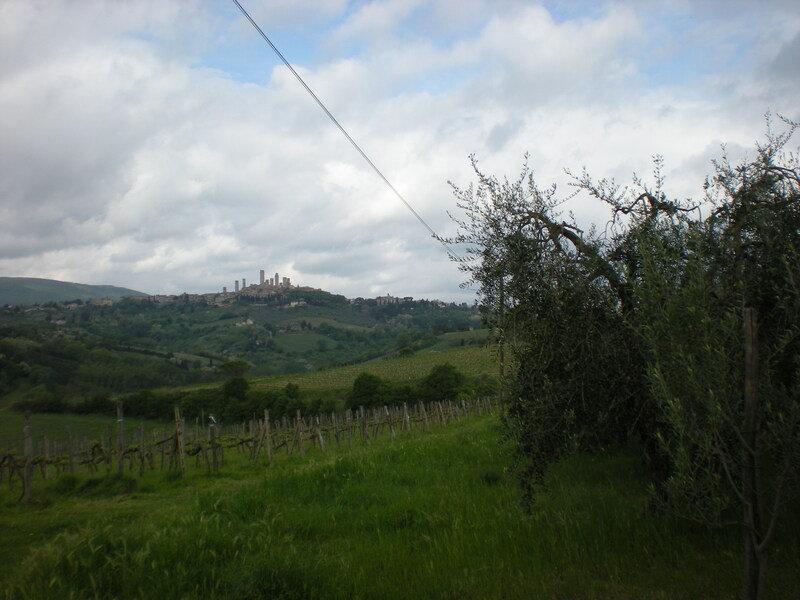 We were looking for the exit towards San Gimignano, the location of our villa, Il Borghetto. (You can read my earlier post on Il Borghetto here.) We also needed to find the entrance to the PAM, a local grocery store, because we needed some supplies for our villa stay. We could see the PAM, but we couldn’t see the entrance. But discovery became part of the adventure. Just after taking the Poggibonsi Nord exit of the Sienna-Florence Autostrada, we found ourselves on a desperate mission to locate a restroom for two members of our party. 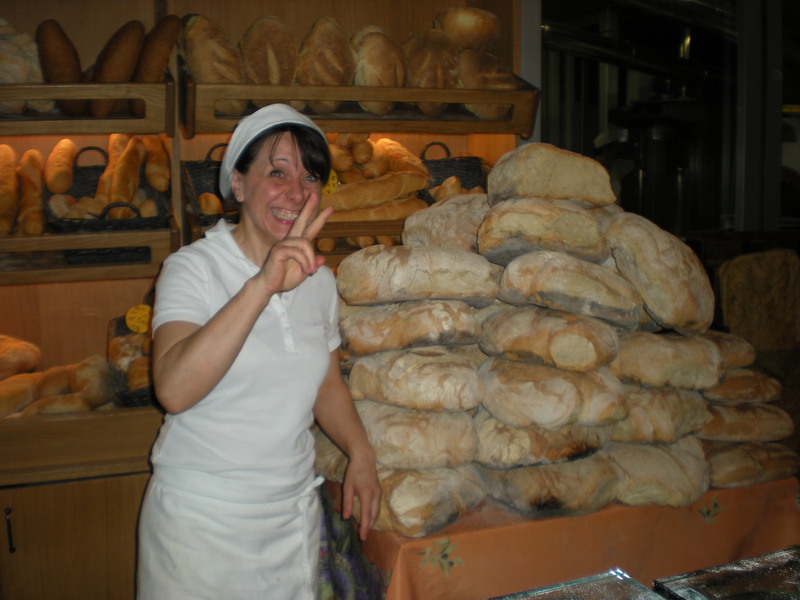 The next morning, we visited the bakery again and were not disappointed. We entered and were greeted by a friendly owner, his assistants, and a dozen locals. 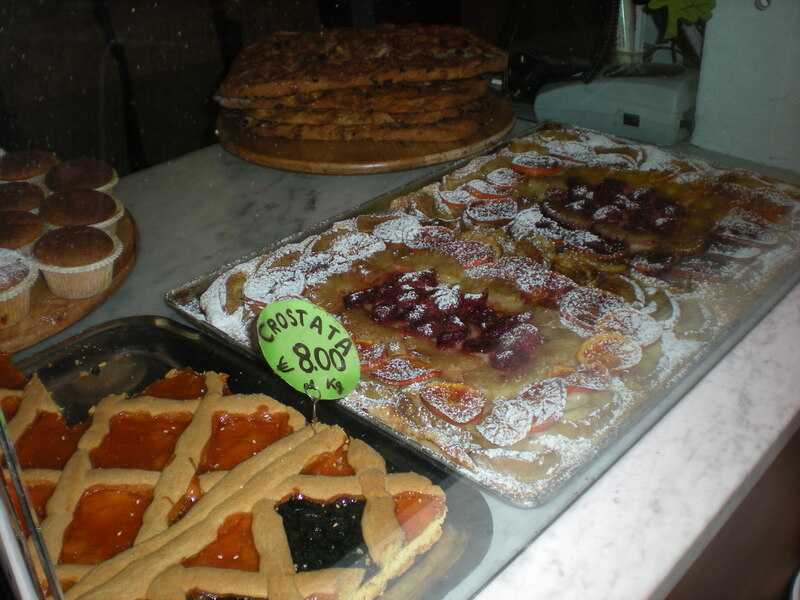 We ogled all the mouth-watering possibilities in the showcases: limone tarte, carnetto (sweet croissants), pizza, la sfogliatella (filled, flaky-layered pastries), crostata di frutta (fruit-filled rustic tarts), tiramisu, amaretti (small ameretto-flavored cookies), and so much more. 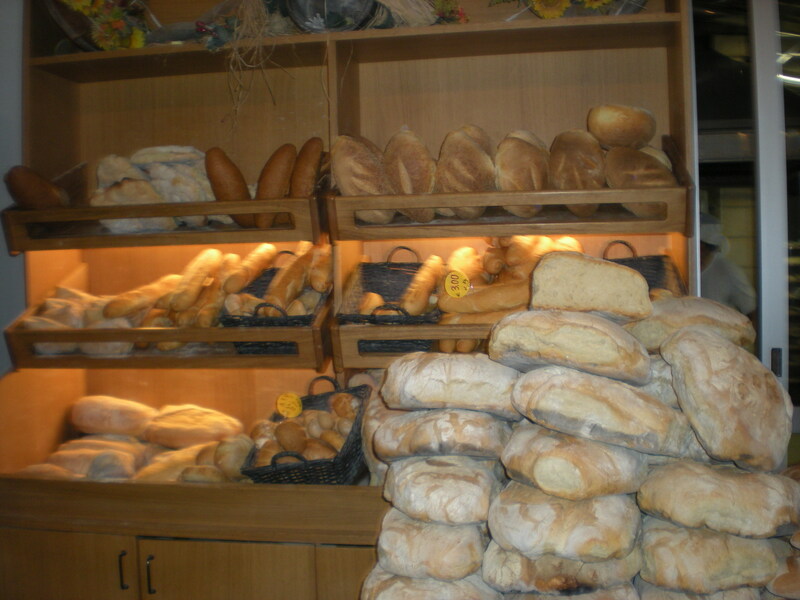 Big round loaves of crusty bread in almost-ready-to-tumble piles, large rectangles of rosemary accented foccacia, and baskets of crusty rolls (il panino) filled all available space behind the service counter. 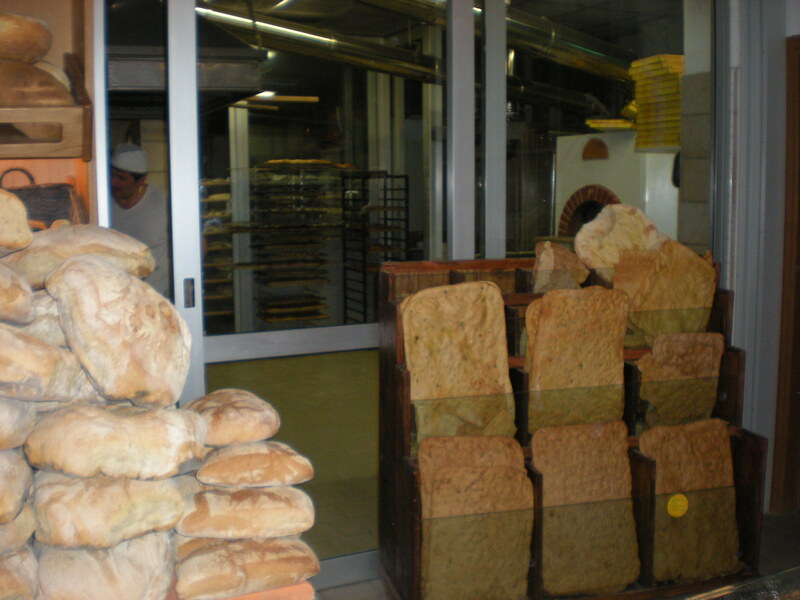 The foccacia, as large as cookie sheets, stood in a rack behind the counter. Tell the clerk how many inches you want (or show her), and she cuts it to order. I got “about this much.” It was delicious with nothing more than its natural flavorings: buttered, salted top with rosemary accent. We went from case to case pointing out delicious-looking possibilities. Decision, decisions. In the end, we all settled for something different. Our bakery selection and a cup of cappuchino, espresso, or caffe macchiato (espresso with cream) made for an hour’s entertainment and a good breakfast that left us smiling for the rest of the day. And better yet, after a few days, we figured out the round-abouts and could find our San Gimignano exit on our first try! 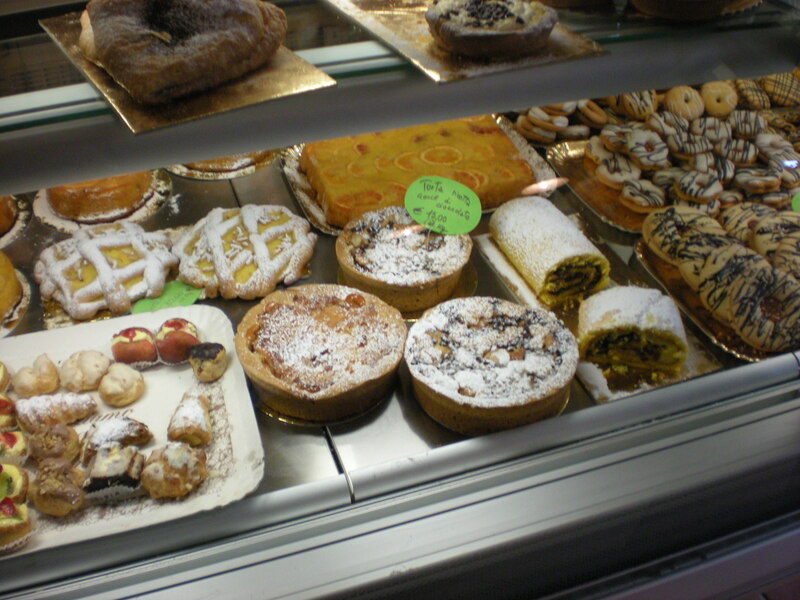 What would you like to try at this little Italian bakery? 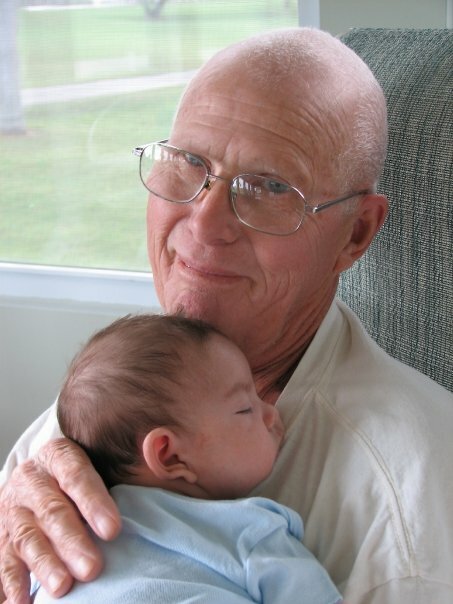 Have You Lost a Family Member, Friend, or Acquaintance to Cancer? 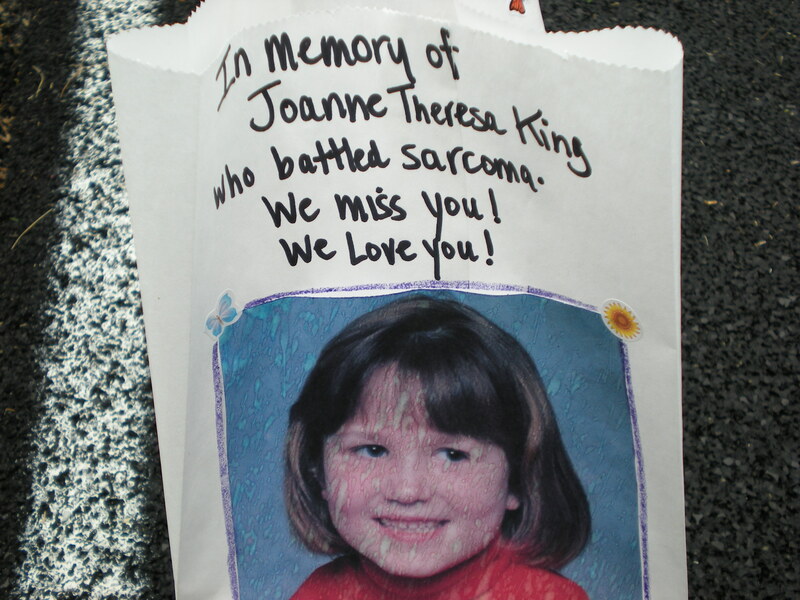 If you have lost a family member, friend, or acquaintance to cancer, you may want to join a Relay for Life in your area. These Relays are held all over the country and world with teams of people raising funds for cancer research. Find a Relay team in your area here. Relay for Life gives a unique opportunity to remember those family members, friends, and acquaintances who have lost their battle to cancer; to pray and hope with loved ones who currently battle cancer; and to celebrate the lives of those whose cancer has been cured or is in remission. 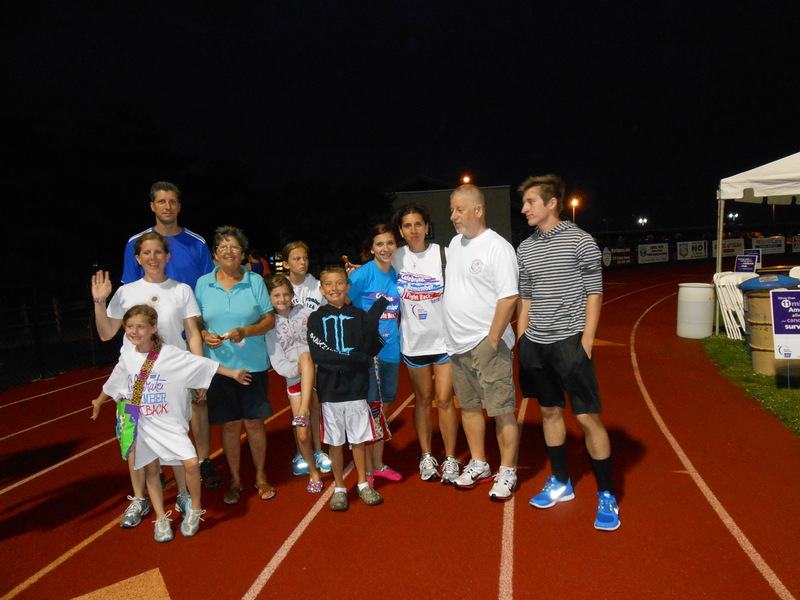 Our local Relay will be held on June 22, 2012 at the Ocean City (NJ) High School track. Last year approximately 75 teams participated in the Ocean City Relay for Life, and we hope for that many teams or more again this year. The opening ceremony sets the tone for the Relay (an all-night event with people walking the track from 6 pm to 7 am, only taking time off for short naps in tents on the field). It is a night of sadness and joy; a night of walking, talking, and bonding with family and friends; a night of music, games, challenges, contests, and outrageous silliness. 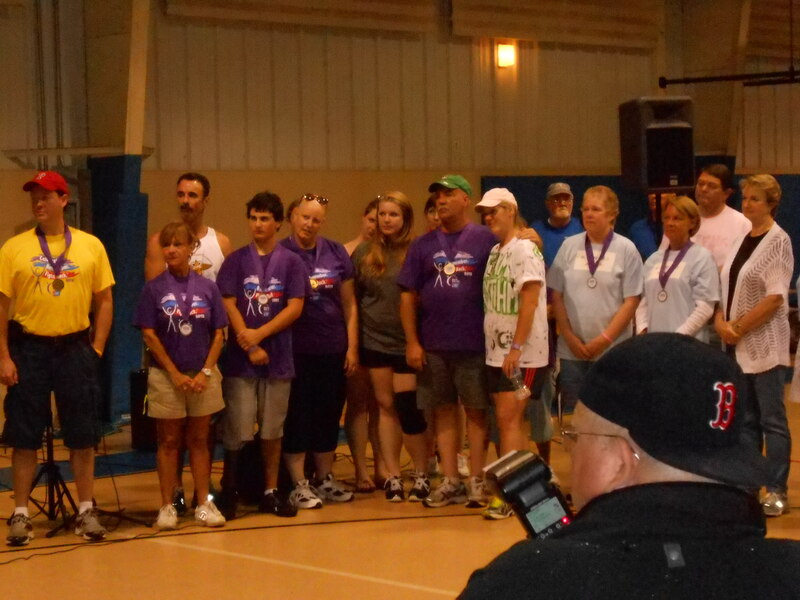 The cancer survivors’ walk, one of two most poignant events of the evening, comes first. 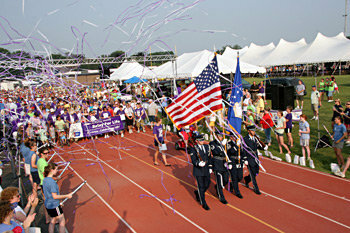 Cancer survivors, wearing purple survivors’ shirts, walk the first lap, giving proof that cancer can be beaten. Relay participants stand along the side of the track and cheer, recognizing the sheer determination and courage it takes to fight cancer. 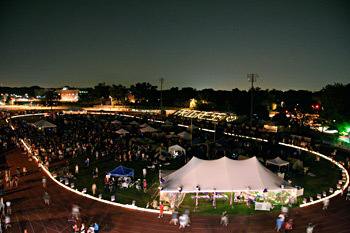 The second poignant event occurs after dark when luminaria (brightly decorated white paper bags with battery powered candles representing all those family members and acquaintances who have lost their battle with cancer) line the perimeter of the track. These luminaria stand in memory of and in honor of moms, dads, babies, children, teens, grandmoms, granddads, aunts, uncles, friends, and other acquaintances. The stadium lights dim; the crowd stands in silence in memory of loved ones lost. Memories and tears flow. and several of my mother’s sisters and brothers. Friends, too, are battling cancer or have lost the battle. This year, the Queen Bee of the Texas Relay for Life, Miss Phoebe Chambers, my very talented and charming great-niece, wil l rejoin the NJ Krewe for the 2012 Ocean City Relay. Pheebs will do anything for attention to raise money to fight against cancer. 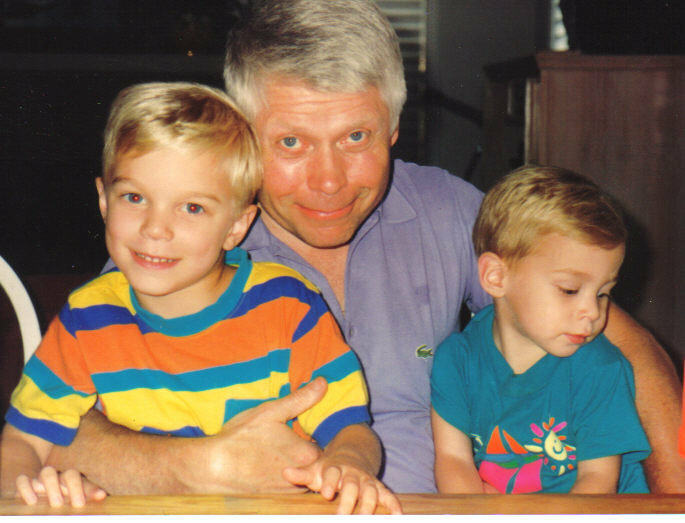 Her grandfather, Robert Kroelinger, my brother, lost his battle to cancer two years ago. This year Pheebs will do a grand repetition of 2010 Ocean City blueberry funnel cake fiasco fund-raiser. This event should not be missed. 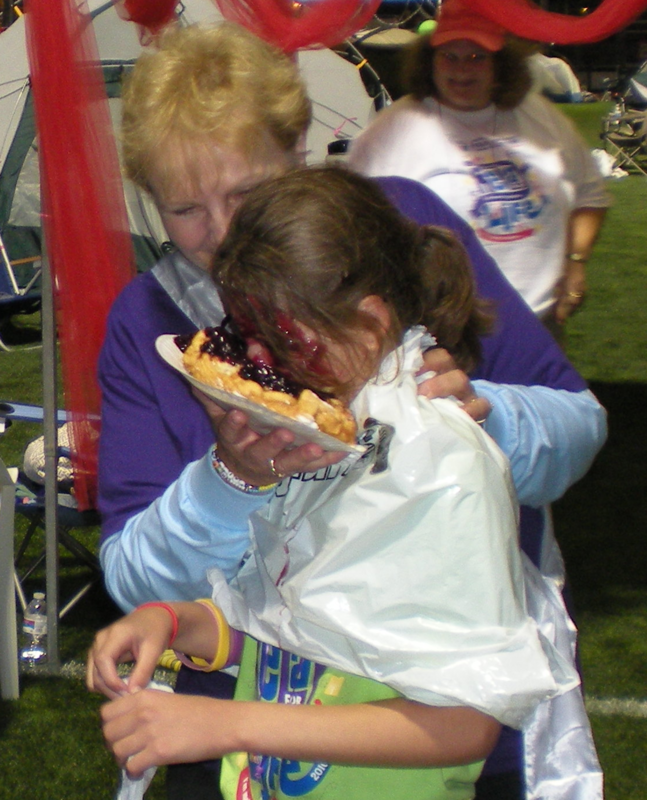 Aunt Patty (cancer survivor) certainly enjoyed smashing Phoebe in the face with the blueberry funnel cake helped the last time Phoebe got stuck with this job volunteered to do this particular fun and tasty fund-raising event. So it was messy. So what? Just throw some of that folding green stuff in Phoebe’s beach bucket and watch the humiliation fun begin. This is a quiet fundraiser other than the laughter and catcalls, so no coins! I think it’s my turn this year…to manhandle the funnel cake, that is. HeeHeeHee. Watch out, Pheebs, I’m gonna getcha! 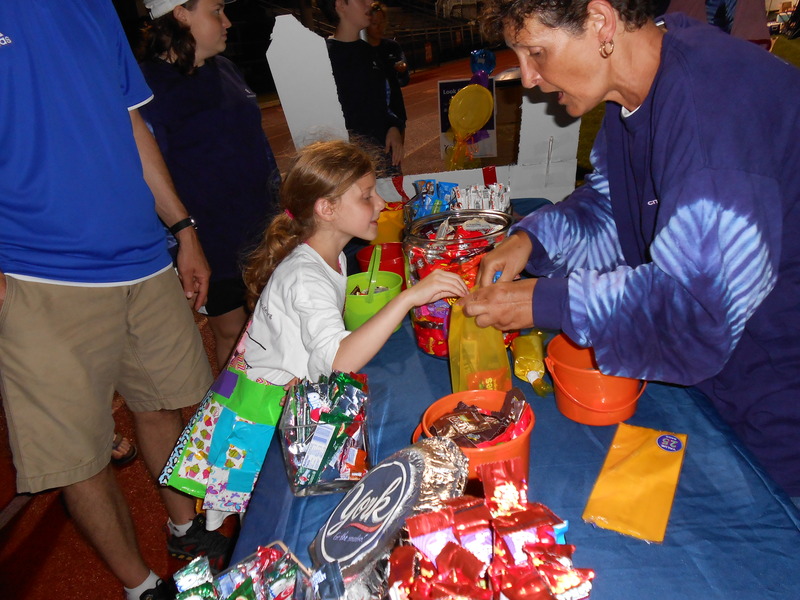 Oh well, Phoebe is a great sport, as well as an enthusiastic fund raiser for Relay for Life. Together with her Kroey Teens against Cancer she helped raise over $10,000 for cancer research. That’s a lot of funnel cakes in the face! If you want to support this on-going cancer-fighting effort, come join us on Friday night, June 22, at the Ocean City (NJ) High School football field, or look for a Relay for Life in your area. I can guarantee you will laugh, and you will cry. The emotional impact that cancer creates when a loved one is lost to this horrible disease is high, but together we can work towards a cure. The Relay provides a bit of catharsis for all of us. 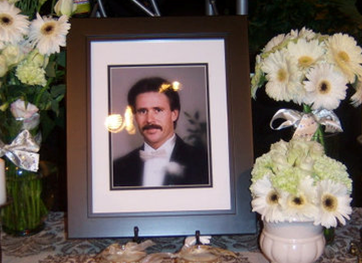 YOUR TURN: Have you lost someone to cancer? 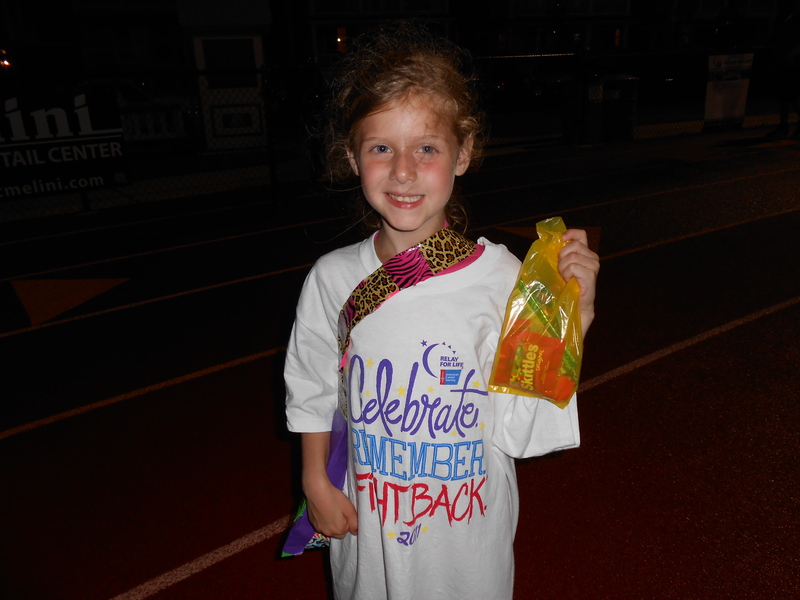 Have you found a Relay for Life near you? What was your Relay like? Did the Relay help you cope with your loss? My Twitter, Facebook, Blogger, and WANA friend, Annmarie Huppert, is househunting and has posted pictures of two possibilties on Facebook: a Spanish villa and a little cabin in the woods. She has solicited opinions from her WANA mates on these two options. Here is a good camp rendition of this song. This song guarantees that you will be stress free, if only for a few minutes. After all, you have to laugh at the foolishness of it all. Now choosing a home can be difficult, and sometimes the two choices need a third alternative. 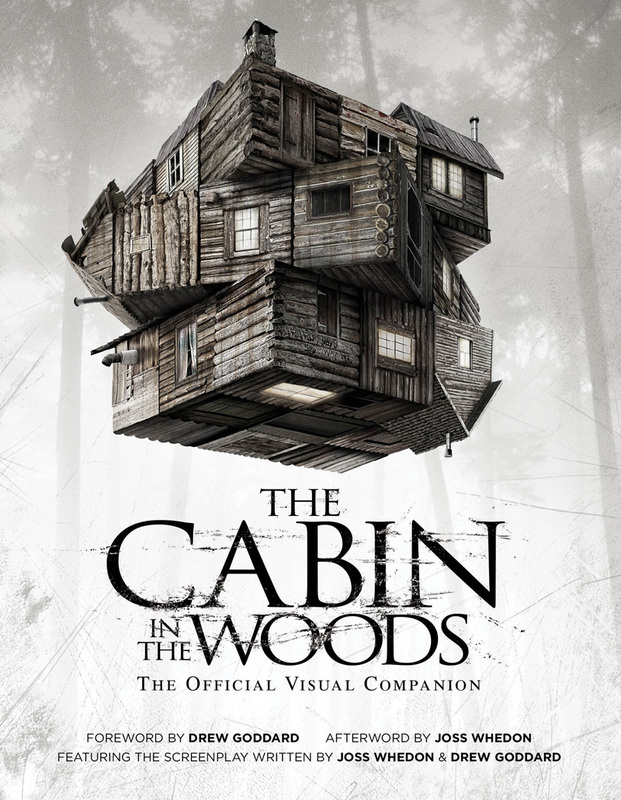 How about this cabin in the woods? Happy House Hunting, Annmarie. We WANA mates are rooting for ya.